Class A coaches manufactured by Coachmen®, Georgie Boy™ and Sportscoach® have all wheels laser aligned to the chassis manufacturer's specifications prior to shipment. MIDDLEBURY, Ind. — Once again leading the industry in true quality initiatives, Coachmen RV Group has invested in a new top-of–the-line laser system for aligning motorhome chassis (all wheels) after the motorhome is manufactured. "At Coachmen, we are continually implementing technologies and procedures to provide best-in-class quality and the safest product on the market. Like our Sealtech system to detect and prevent leaks, this is quality that you may not see on the dealer's lot, but will experience in use. This is true quality and what our customers deserve," said Michael R. Terlep, president of Coachmen RV Group. "We added complete motorhome alignments to our manufacturing process in response to a recommendation from one of our dealers. Not only will this new alignment system and process ensure consumers an excellent drive and ride, having the wheels properly aligned will prolong the life of the tires and yield better gas mileage." In addition, Coachmen also weighs every motorhome it manufactures prior to shipping. Each axle and wheel is weighed on computer scales to assure that each and every unit manufactured complies with the chassis manufacturer weight ratings. A detailed weight sheet, specific to that motorhome, is included with each motorhome Coachmen manufactures. "This too ensures a safe, reliable and simple to operate product for our customers, while providing them with the necessary information to load their vehicle for trouble free use," added Terlep. 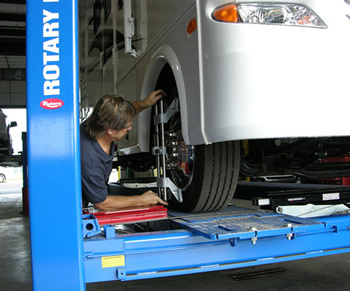 "No other RV manufacturer aligns, weighs and seal tests the way we do."